Everyone, it seems, is celebrating the 500th anniversary of the Protestant Reformation. There’s good reason to celebrate it. The Reformation, after all, was a recovery of the gospel, which had been muddled by the traditions of men. That recovery was made possible by the reaffirmation of five key doctrines. 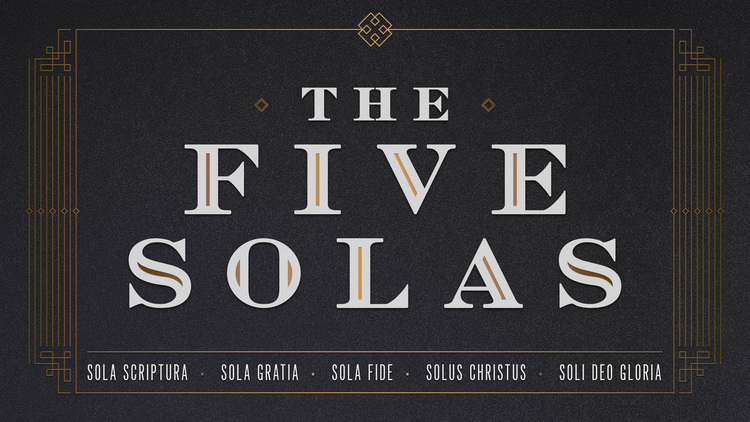 Hailed today as the “Five Solas,” these doctrines served to point the church afresh to the true gospel. They are the pillars of Reformation Theology. For the month of October I intend to look at each of these five pillars and discuss their contribution to the reformation’s start, and its continuance today. We begin with the pillar Sola Scriptura – Scripture Alone. Sola Scriptura has been identified as the formal principle of the Reformation. It establishes Scripture alone as the source of sound doctrine.The Bible, in Reformation thought, was the primary authority, and all others secondary and subject to it. This was a pronounced and shocking reorientation at the time. It wasn’t, of course, that the Medieval Church had completely ignored the Bible. The Scriptures were upheld by nearly all as a chief document for the faith and life of the church and the believer. But in practice it was often minimized or placed into subjection to the ecclesiastical authorities, chiefly the Pope. So the Word of God was an authority, but that Word was the sole property of its chief interpreters – the hierarchy of the church. The Word was also supplemented by the decrees and canons of formal councils which collectively composed the body of church tradition. The traditions of the church, over time, began to be seen as equal to the Scriptures in authority. So, Church tradition could establish new doctrine. The Bible had its place, but its place was beneath the authority of the church. The impact of this on the gospel was particularly pointed. The subordination of the Word of God to church tradition and extra biblical teaching led to the development of a deeply flawed view of the nature and reception of divine grace. The late Medieval system saw justification as a progressive act in which the sinner merited grace through the right adherence to Sacramental System. The entirety of the gospel had been altered in this system and the heart of salvation had been turned into a joint effort between God and man. The Reformation emphasis on Sola Scriptura, then, was not simply about affirming the priority of the Bible over church councils and Popes. The pillar of Scripture Alone was the means by which the recovery of the gospel first started. Martin Luther knew, first hand, the insufficiency of this soteriology. He had been a good monk and done all his proper duties, yet he found no peace with God. Whatever grace he merited it was never enough to quiet his anxious soul. It was upon reading Scripture, particularly Paul’s epistle to the Romans, that he discovered an entirely different view of salvation: salvation was by grace through faith and not by works! The Scriptures opened the doors to heaven for the young man, and he would never again turn from them. The doctrine of Sola Scriptura was not intended to suggest that the Bible was the only authority. None of the so-called Magisterial Reformers denied the authority and significance of theological councils, nor of the Church Fathers. The issue was one of primacy. The Roman Catholic Church at the time had held the Bible to be equal with councils and traditions. They had held that the Pope was gifted uniquely with insight from the Holy Spirit and thus when he spoke ex cathedra he spoke with divine authority and infallibility. While the Reformers could acknowledge other authorities, they saw the pressing need to subject all ecclesiastical judgments to the Scriptures. This was the pimrary way to safeguard true doctrine. This came to a particular head for Luther with the subjects of Purgatory and Indulgences. With the development of the system of Indulgences it was argued that a person could reduce their time in Purgatory through financial compensation to the church. The whole idea outraged Luther. They served as the impetus to the 95 Theses, in which Luther argued that the Pope did not have authority to determine the fate of departed souls. It was particularly egregious to suggest he could determine their fate if the right amount of money were given. In time Luther came to see that the bigger issue was that the church had come to depend on tradition over and against Scripture. In fact, they had used tradition to overturn Scriptural teaching. Thus began the cry of Sola Scriptura! The health of the church requires that we look to the Bible as the source of authority for all matters of life of faith. God’s Word is sufficient to instruct us in the things of God. In fact if we don’t submit to the supreme authority of the Bible we are left in confusion and chaos. Whose teachings do we add to Scripture? How do we know who has authority and who doesn’t? What do we do when other teachers contradict Scripture? What do we do when other teachers contradict one another (as was the case in the “Western Schism,” 1378 – 1417, when there were two Popes)? The Bible as the sole authority protects the church. Sola Scriptura is as relevant today as it was in 1517. The Bible Alone should still be a pillar of our theology.